Three rough-toothed dolphins were rescued after they were found stranded on mud flats created by the receding tide at Ao Makham (Cape Panwa) on Saturday. 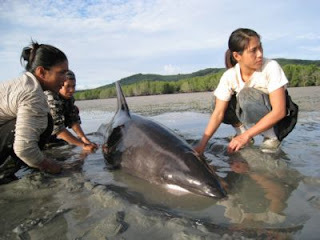 The rescue comes one week after the carcass of a female striped dolphin was discovered washed ashore at Baan Dan in Thalang and nine days after a pod of false killer whales beached at Koh Racha. One theory put forward was that they were fleeing a disturbance, possibly something man-made.